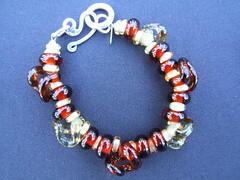 While I'm recommending neat stuff, our favourite glass jewellery designer has just updated his web site. We met Kevin on his stall outside the Ferry Building in San Francisco, and go back to see him regularly. 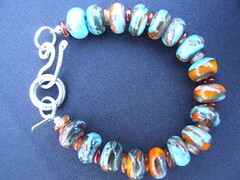 He makes beautiful pieces of lampwork glass, using coloured Murano glass, and has designed his own silver clasps. 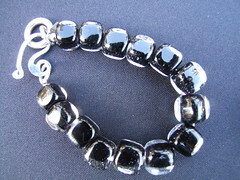 Each time we meet him he has something new, and often they're quite unusual and beautiful. I took some photographs of some of his work a while back. I regularly wear a couple of his pendants - they're beautiful work, and the red goes really well with the deep green of New Zealand jade. 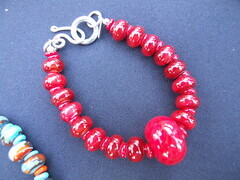 I also have a couple of bead earrings for special occasions. 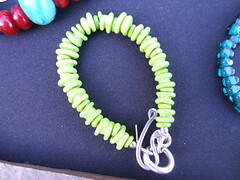 marypcb has a selection of necklaces, earrings and bracelets. He'll do custom work and can send it to most places. Contact details are on his web site. I'll switch them over to two per line to be sure.